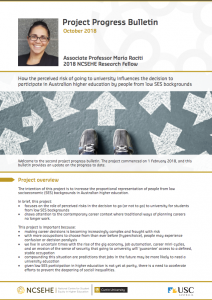 How the perceived risk of going to university influences the decision to participate in Australian higher education by people from low SES backgrounds. Welcome to the second project progress bulletin. The project commenced on 1 February 2018, and this bulletin provides an update on the progress to date. The intention of this project is to increase the proportional representation of people from low socioeconomic (SES) backgrounds in Australian higher education. draws attention to the contemporary career context where traditional ways of planning careers no longer work. given low SES participation in higher education is not yet at parity, there is a need to accelerate efforts to prevent the deepening of social inequalities. serves an instrumental purpose (that is, getting a job in an occupation of their choice).